Semifinal action took place Thursday at the 2019 Canada Winter Games, with Alberta’s hunt for gold coming to an unfortunate end. Trailing 6-0 after 40 minutes, Alberta stormed back with four-straight goals in the third but couldn’t complete the comeback against Ontario in an 8-4 loss. 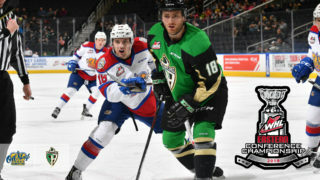 Zack Ostapchuk (St. Albert, Alta./Vancouver Giants), Colton Dach (Fort Saskatchewan, Alta./Saskatoon Blades), Matthew Savoie, and Tyson Laventure (Lloydminster, Alta./Prince Albert Raiders) scored for Alberta in the loss. Kyle Masters (Edmonton, Alta./Red Deer Rebels) had three assists in the game while Dach added a helper to his goal for the multi-point performance. 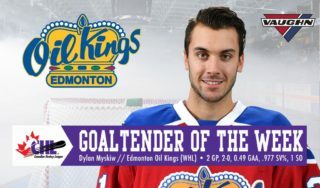 Corson Ceulemans (Beaumont, Alta./Moose Jaw Warriors), Jayden Grubbe (Calgary, Alta./Red Deer Rebels), Kai Uchacz (De Winton, Alta./Seattle Thunderbirds), and Dylan Guenther (Edmonton, Alta./Edmonton Oil Kings) each picked up a single assist in the loss. Drew Sim (Tees, Alta./Vancouver Giants) took the loss in net. In the first of two semifinals, Québec doubled up Saskatchewan 6-3. 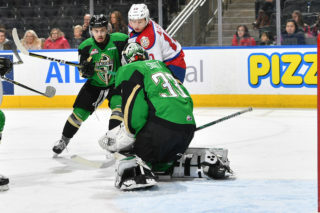 Saskatchewan led 2-0 after 20 minutes on goals from Ashton Ferster (Prince Albert, Sask./Medicine Hat Tigers) and Blake Swetlikoff (Regina, Sask./Spokane Chiefs), but conceded four in the second to trail by two after 40 minutes. Cole Sillinger (Regina, Sask./Medicine Hat Tigers) scored in the third, but Québec would tack on two more goals in the final period. 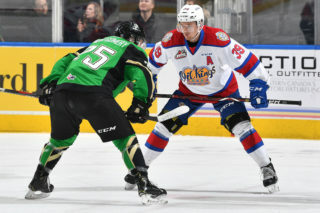 Sillinger would have the lone multi-point game for his province while Logen Hammett (Regina, Sask./Brandon Wheat Kings) and Logan Cox (Prince Albert, Sask./Spokane Chiefs) each picked up a single assist. Brett Mirwald (Saskatoon, Sask./Moose Jaw Warriors) stopped 41 shots in the loss. 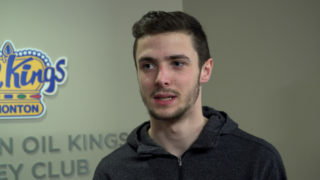 Logan Stankoven (Kamloops, B.C./Kamloops Blazers) had a goal and an assist Thursday as British Columbia fell 3-2 in overtime to Nova Scotia. 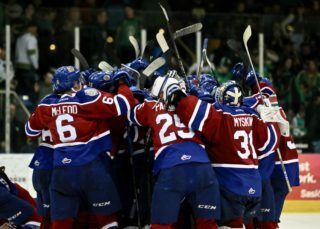 Michael Abgrall (Richmond, B.C./Edmonton Oil Kings) scored the other B.C. goal while Trevor Wong (Vancouver, B.C./Kelowna Rockets) picked up an assist in the loss. Keegan Maddocks (Langley, B.C./Victoria Royals) stopped 28 shots in the game. Conner Roulette (Winnipeg, Man./Seattle Thunderbirds), Dawson Pasternak (Winnipeg, Man./Portland Winterhawks) and Cole Assailly each had a goal and an assist Thursday as Manitoba downed New Brunswick 6-2. Manitoba spread out their scoring evenly over the three periods, with Hudson Thornton (Winnipeg, Man./Prince George Cougars) and Hunter Wallace (Oak Lake, Man./Brandon Wheat Kings) scoring in the first period. Goals from Pasternak and Assailly featured in the second while Roulette and Trentyn Crane (Winkler, Man./Victoria Royals) scored in the third. Both Manitoban goaltenders saw action in the win. Conor Geekie had a pair of helpers while Skyler Bruce (Winnipeg, Man./Kootenay ICE), Rory Neill (Winnipeg, Man./Calgary Hitmen), Aidan Brook (Roblin, Man./Medicine Hat Tigers), Roux Bazin (Treherne, Man./Victoria Royals), and captain Carson Lambos (Winnipeg, Man./Kootenay ICE) each picked up a single assist in the win. Northwest Territory finished their tournament with a win Thursday, downing Nunavut 4-2 for 11th place at the tournament. 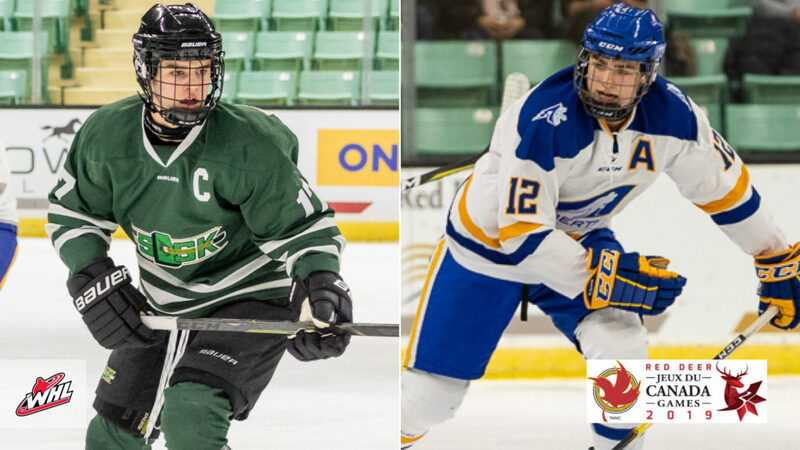 Samuel Schofield (Yellowknife, NWT/Swift Current Broncs) had a pair of assists while Jonah Bevington (Yellowknife, NWT/Portland Winterhawks) had a single helper in the victory.